Boy do I have a fun money saving recipe for you today! Ok, take a trip with me- close your eyes (well not really because you need to read this!) and imagine we're walking through our local health food store looking to buy some coconut milk. There are so many kinds out there! Canned, cartoned, full fat, low fat, some with stabilizers/gums, some without. What in the world do we do?! How do we choose!? Well, you don't. I mean if you want to know the store bought answer, it's- full fat, canned coconut milk without anything more than coconut (and water) as the ingredient. Anything more is unnecessary and not as healthy as it could be. But hold on, because all those cans and cartons add up! Pricey stuff! Think about it- 1 can of the cheapest coconut milk (without any stabilizers or gums) that I could find, is $1.99 for 13.5 ounces. Ok not so bad. But when you go through it like you would a quart or gallon of milk, because you're paleo or avoiding dairy for whatever reason, that adds up! 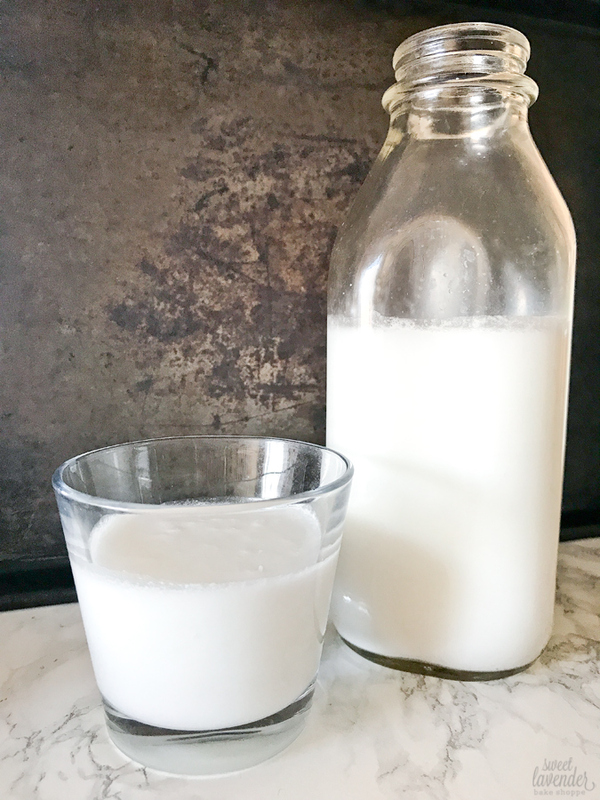 What if I told you, you could make your own coconut milk (just as good for you! without any stabilizers/gums!) just as easily?? And for a lot less money! Plus have fun?! Are you in? This 2 ingredient (2 if you count filtered water!) 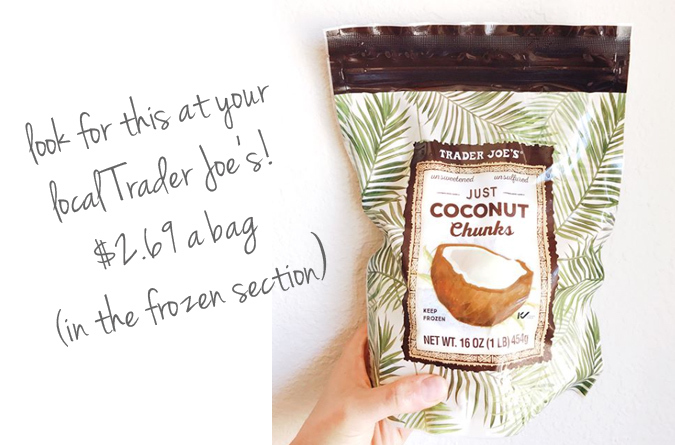 coconut milk uses a bag of Trader Joe's frozen Just Coconut Chunks which will cost you about $2.69 for a 16 ounce bag. I got 2 rounds of this recipe with one bag. So thats about 7 cups of homemade, gum free, all natural, super clean coconut milk for $2.69. 7 cups of the canned version will run you around $8.25 if my math is correct. 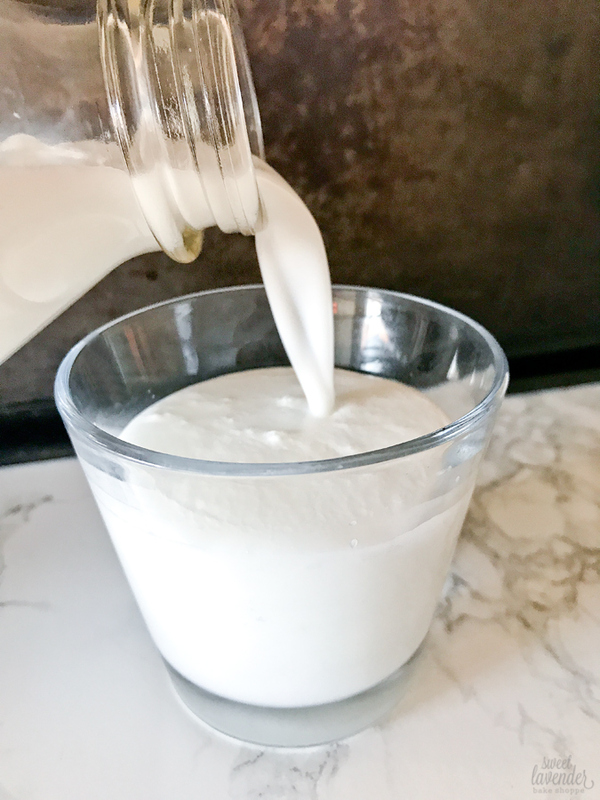 This stuff is just as easy as making your own nut milks, but without the soaking. The soaking time is now defrosting time. But thats ok. Throw some into a bowl the night before, allow it to thaw, and in the morning you've got yourself some fresh homemade coconut milk for whatever your heart desires. I'm using this for things like smoothies, matcha lattes and homemade golden milk lattes. PLUS, we also get some finely shredded coconut out of this as well (in the form of that leftover coconut pulp). SO there's that we don't have to purchase either! Win. 1. Once your coconut chunks are fully thawed, place them and 3 cups of filtered water into a high speed blender. You can use less water if you'd like it creamier! 2. Blend on high for 2-3 minutes, depending on the strength of your blender. 3. Strain milk through a nut milk bag into a bowl and make sure to really squeeze all of the coconut pulp extracting as much milk as possible! Don't have a nut milk bag? You can do this with a clean tea towel as well. 4. Pour into a pitcher and store in the fridge for up to 5 days! Stir or shake before using. *Don't throw that coconut pulp away. Store in an air tight container in the fridge (or freezer for longer storage) and use as you would finely shredded unsweetened coconut in your recipes. *You can also blend one pitted date and 1/4-1/2 teaspoon of good quality vanilla extract for extra flavor! Make sure if you add the date that you remember you now have SWEETENED finely shredded coconut. GENIUS. I have been fairly obsessed with making my own almond milk (it's so fun and so EASY) but I just bought a bag of this coconut at my local TJ's, and now I can't wait to make it! And I love that you can use the coconut shreds just as I use the leftover almond meal. Thanks!! Right!?! Oh man. So fun. I love economical hacks!